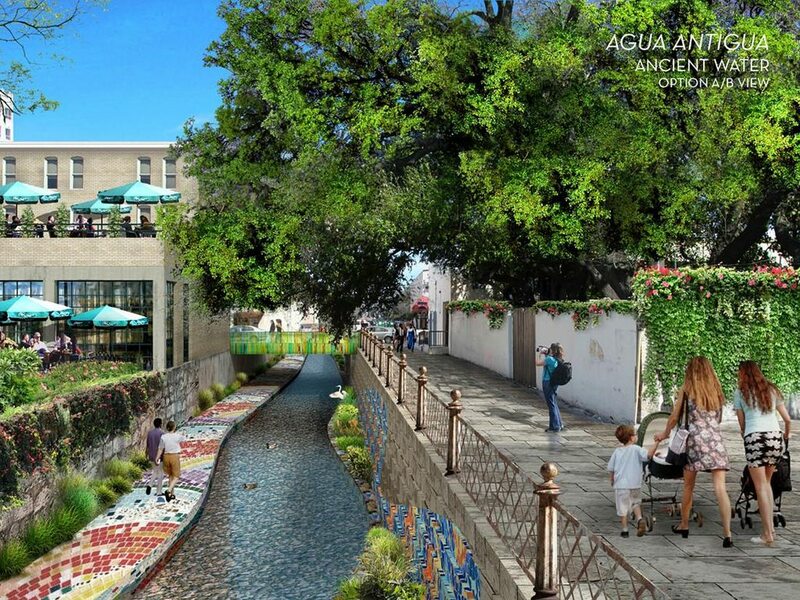 With redevelopment of the San Antonio River nearing completion, Bexar County is turning its attention to San Pedro Creek. 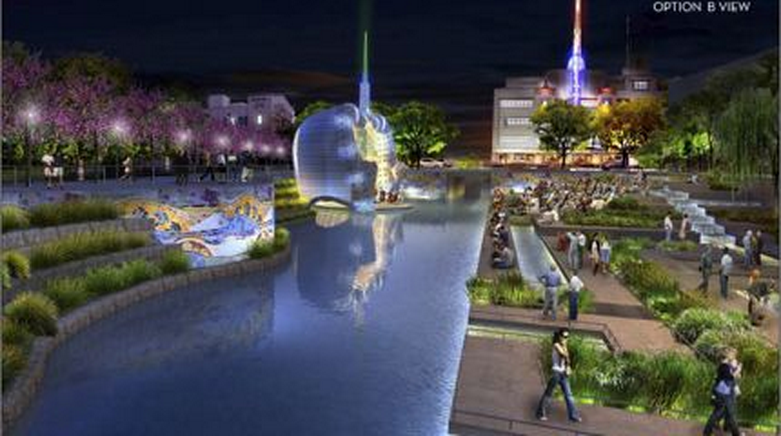 Commissioners Court on Tuesday plans to dramatically reverse the fortunes of San Pedro Creek . Backed by a court majority, County Judge Nelson Wolff will propose a $175 million ecosystem restoration on a 1.5 mile segment of the 3 mile creek. The court will seek engineering designs now that a $760,000 study has concluded the project is challenging yet doable. Officials want the creek to be a linear urban park, retaining its flood-control role while providing new recreational amenities like those on the river's Museum Reach and Mission Reach. Right-of-way would have to be acquired and myriad stakeholders consulted, but construction could start in 2016. 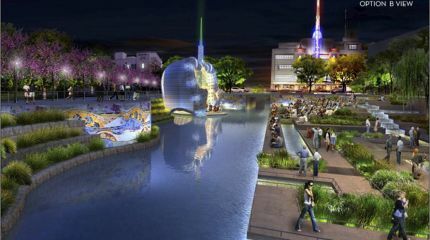 By 2018, the creek would have walkways, landscaping and perhaps a performance venue in the stretch between Fox Tech High and South Alamo Street. Smith said the county has $125 million available to launch the effort. Last edited by sirkingwilliam; May 21, 2013 at 6:16 AM. Last edited by sirkingwilliam; May 21, 2013 at 5:21 AM. Rendering of the proposed new linear park planned for downtown. A GSA Design Excellence project, the new San Antonio Courthouse is designed to generate civic pride and a dignified presence that captures the cultural spirit of San Antonio through its use of local vernacular and natural materials. The project replaces an outdated courthouse with a modern, 110,000-square-foot state of the art facility. A key element of our design focuses on interior courtyard and connection to the adjacent San Pedro Creek. The $85 million project is currently in design development and slated for completion in 2016. 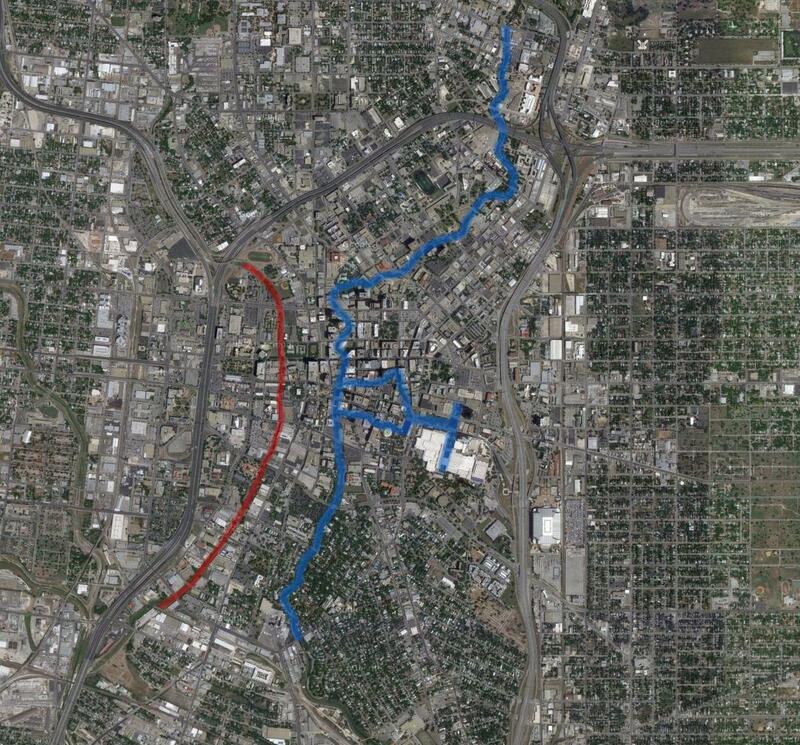 Here's a map I made detailing both the urban segment of the Riverwalk (blue) and the 1.5 mile segment of the San Pedro Creek (red) that will become a linear park. Woah, $175 million?! Don't get me wrong, I love the renderings and have been dying for them to do something with San Pedro Creek(it's about damn time they've done something), but that is a lot of money for 1.5 miles of park. I would imagine a decent chunk of that cost will go towards aquiring right of way and reconstruction around roads. This is just what the west end of downtown needs. Go big or go home! I agree that this is what the west end of downtown needs. It's kind of dreary. 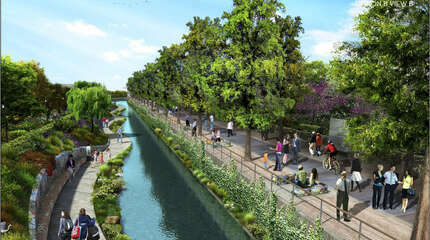 Maybe there could be a way to connect the San Pedro creek to the Riverwalk in a green way. I'm trying to look for a good route for it happen, but it's kind of hard. Much of the way, they're only 4 short blocks apart. Just wide sidewalks shaded with awnings on several streets should be sufficient - plus the future streetcar line could provide a unique connection. I don't think the connections have to be green. I made an imgur album with all the images for this thing. Last edited by sirkingwilliam; May 23, 2013 at 12:31 AM. The best place (with least amount of work to do) would be along Houston St.; wide sidewalk exist between Camaron and Flores, "park" is in front of Frost, and as long as sidewalks are kept wide and tree-lined in front of the Rand Bldg., it would only be a short half-block to get to the River. Second would be Nueva (isn't that where SC route is planned for?). The space behind the new Justice Center and County Courthouse has wide sidewalks and are both tree-filled now; it would just require improvement to the back side of the City Towers (once built) and acquiring some land before or after the River to give access on the North side of Nueva. Since SP Creek eventually dumps into the SA River off Probandt and Mitchell, I would say just keep the ecosystem restoration and some trails going all the way South (that might be the long term plan), and join the two up. Give the people a riverside running/biking track. Considering SP Creek is underground from Cesar Chavez to just South of El Paso St., that's quite a bit of land (from hotels) to be purchased in that small stretch. Last edited by miaht82; May 22, 2013 at 1:45 AM. A soccer stadium at the old Fox Tech fields would be an awesome addition to DT SA. Plans don't include uncovering that stretch of creek, just building a shaded walkway. Look again, there are two options for that segment. Can someone who is better at reading these plans tell me if the path goes below the streets or not? To me, it looks like the answer is no. Last edited by Spoiler; May 22, 2013 at 8:48 PM. There are a couple of options where it would be below street level. One has a more "natural" look (like the Mission Reach), and the other is a mix (Museum Reach). And like you pointed out in one of the options, there is also the option in that stretch to not expose the creek, just for a walkway to connect and to be spruced up. I'm assuming if a path below street level were the case, that it would be able to be closed if overflow were to come up. It already appears that the flow would have to be adjusted seeing as how it is currently a crik or a "leak", not so much a creek.